This is my current favourite and by far, the most-produced cupcake combination in the kitchen, and I finally felt a need to blog about them. The very first chocolate and peanut butter combination came from here (pardon the quality of those photos heh), which is also a cupcake, but has a different cake recipe. It’s a bit more troublesome as it uses the traditional “whip-the-butter-and-sugar” route. The second combination came from here, which is a layered cake with jam and peanut butter I made for my friend’s birthday – and that is the combination I’ve stuck with ever since. 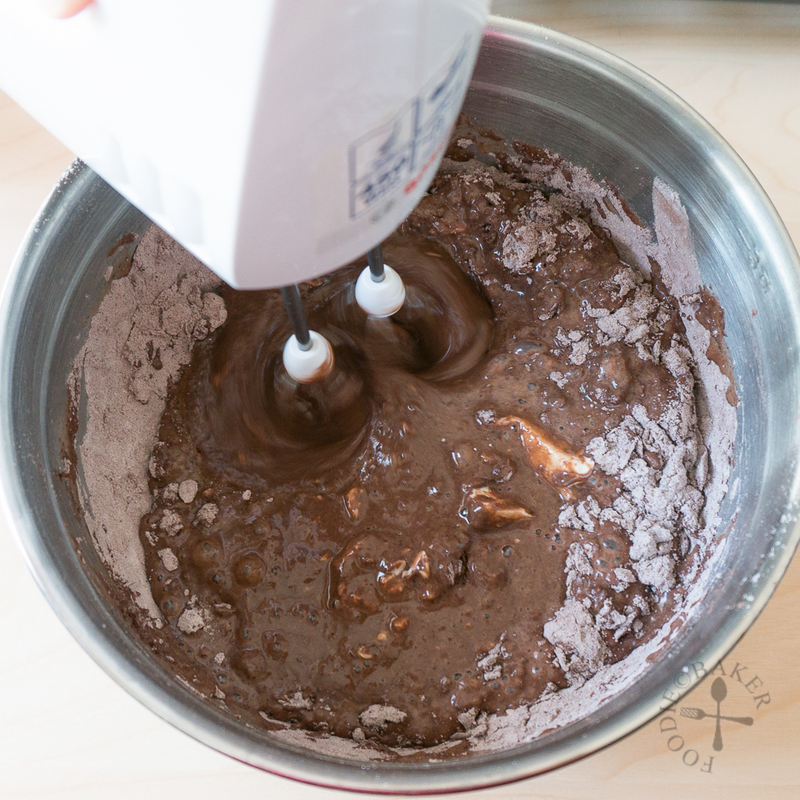 The chocolate cake is my current favourite chocolate cake base recipe – making it is super easy as it’s a one-bowl recipe. Texture wise, it’s heavier and richer than a genoise so it holds fillings well but not too overwhelmingly rich that makes you sick of the cake after a few mouthfuls. 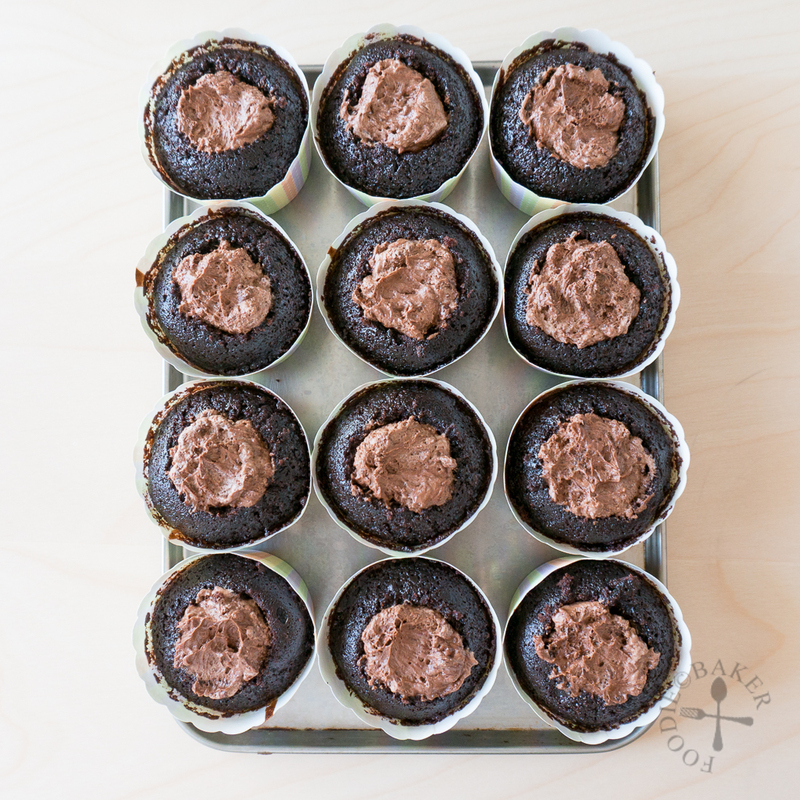 The use of a good-quality cocoa powder really helps to bring out the chocolatey note in these cupcakes. I love filled cupcakes as it makes cupcakes so much more interesting. Imagine the surprise when you find that there’s something hidden inside the cupcake! 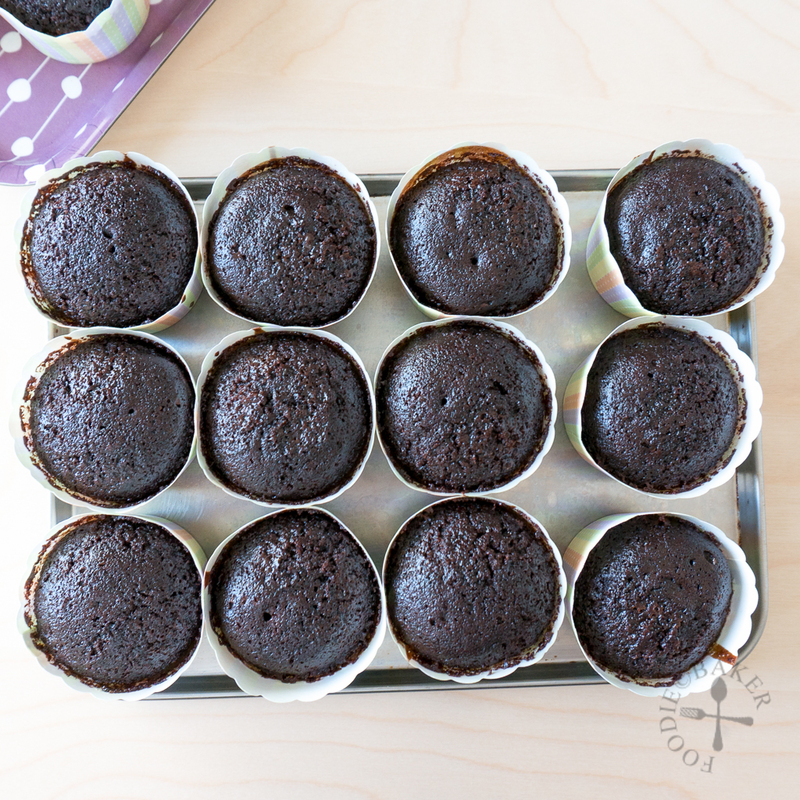 Fillings add in a whole new dimension of flavour and also help to keep the cupcakes moist. I’ve filled them with strawberry jelly, cream cheese frosting, chocolate mousse etc. I’m thinking of an exotic flavour to fill them in the next time, maybe sesame? 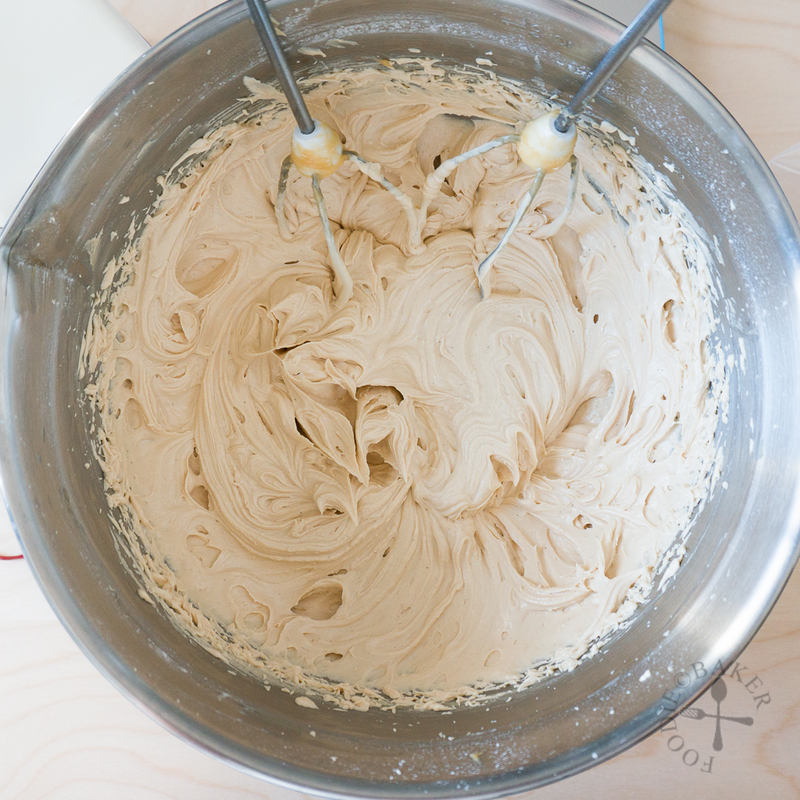 And if you love peanut butter, this frosting is definitely something to die for. I love it because I can control the amount of sweetness with salt (I love peanut butter that is more on the salty side). It’s also creamy and so delicious with the chocolate cake base. 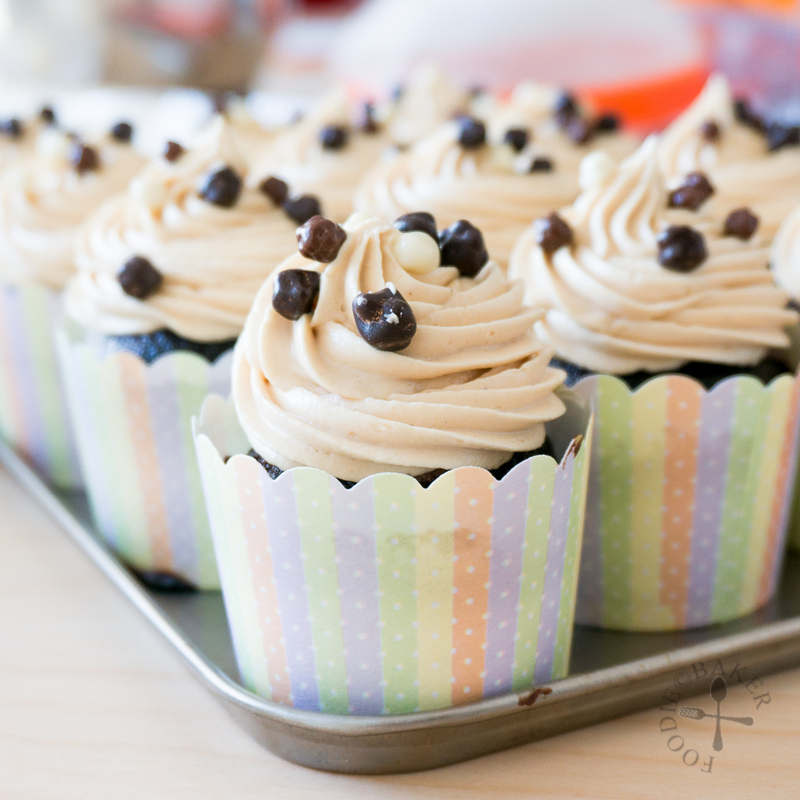 Making these cupcakes is not difficult and all the components can be made all on the same day. But what I like and tend to do is to bake the cupcakes a day before, then fill and frost them the next day before the party. You can also make the cupcakes even earlier and keep them in the refrigerator, just let them come to room temperature before serving so the frosting and mousse can soften. 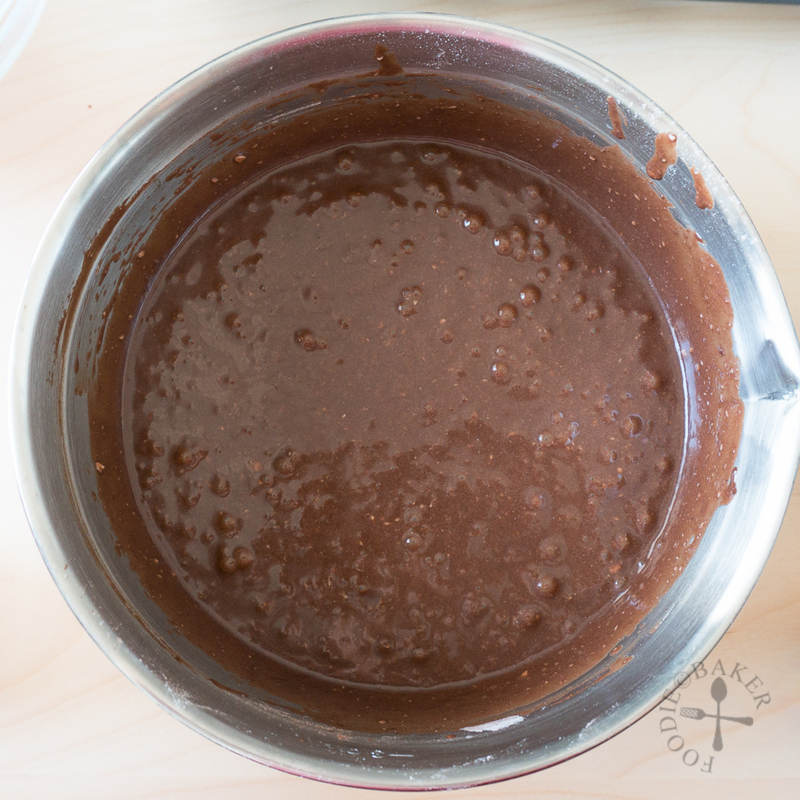 1) Measure the wet ingredients and sugar together in a large mixing bowl. 2) Sift in the dry ingredients. 1) Melt some dark chocolate and let it cool. 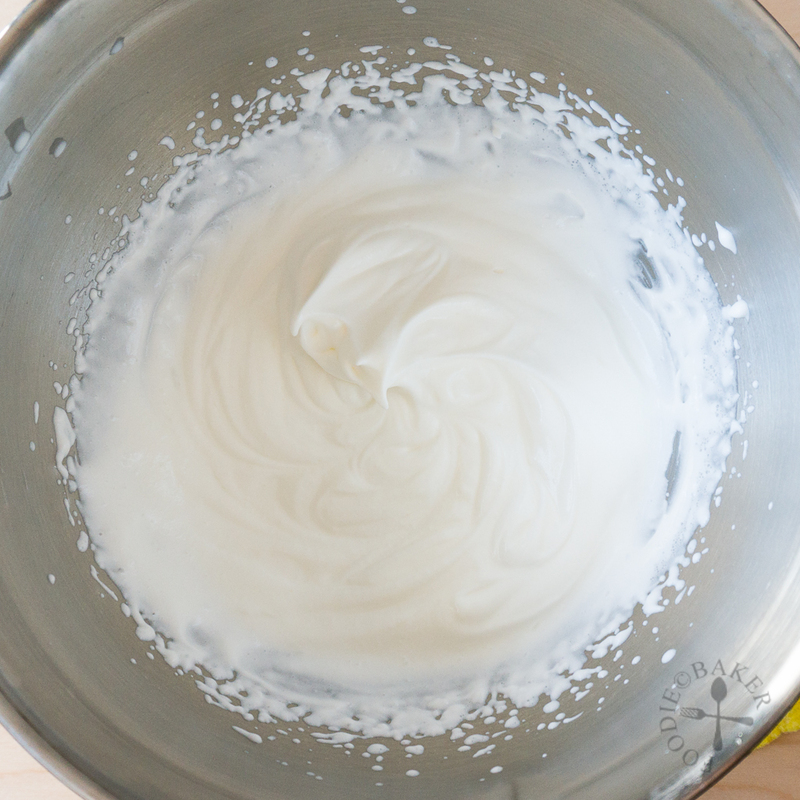 2) Whip the heavy cream until soft peaks formed. 3) Fold in the whipped cream. 4) And ta-da! Your mousse is ready. 1) Measure all the frosting ingredients. 2) Beat until light and creamy. 1) Grab your cooled cupcakes. 2) Cut out a cone from the cupcakes so you have a cavity. 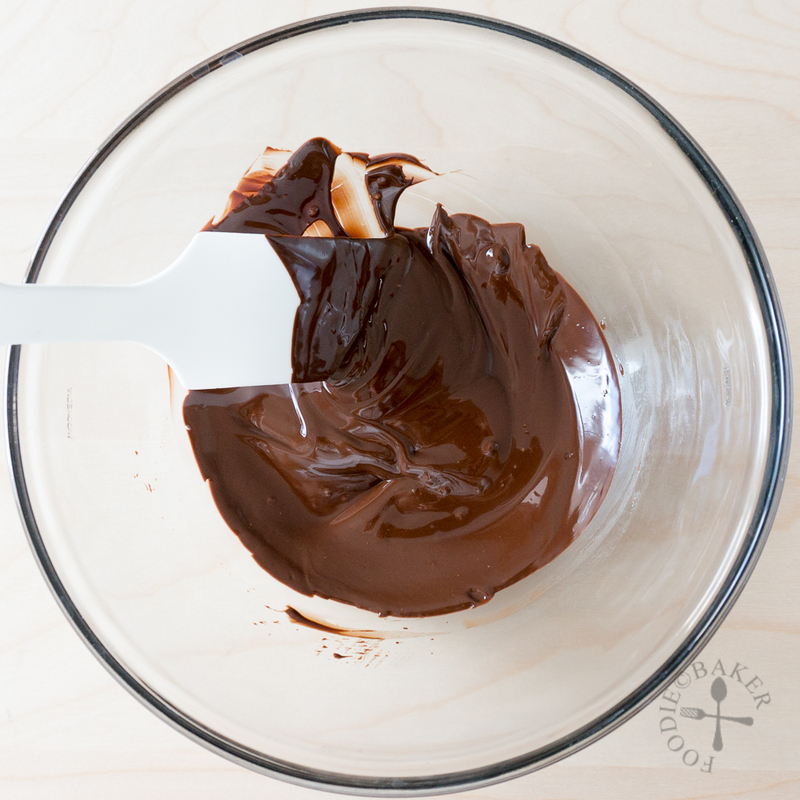 3) Fill the cavities with the chocolate mousse. I am super generous with the amount of mousse filled. 4) Replace the top of the cupcake, it's okay if it doesn't cover the mousse completely. 5) Frost the cupcake with the peanut butter frosting. 6) And decorate them if desired! Definition of "crowd pleaser" - One-bowl chocolate cupcakes filled with an easy no-egg dark chocolate mousse and frosted with an insanely creamy and delicious peanut butter frosting. Preheat oven to 175 degrees Celsius (350 degrees Fahrenheit). Line cupcake moulds with paper liners and set aside. 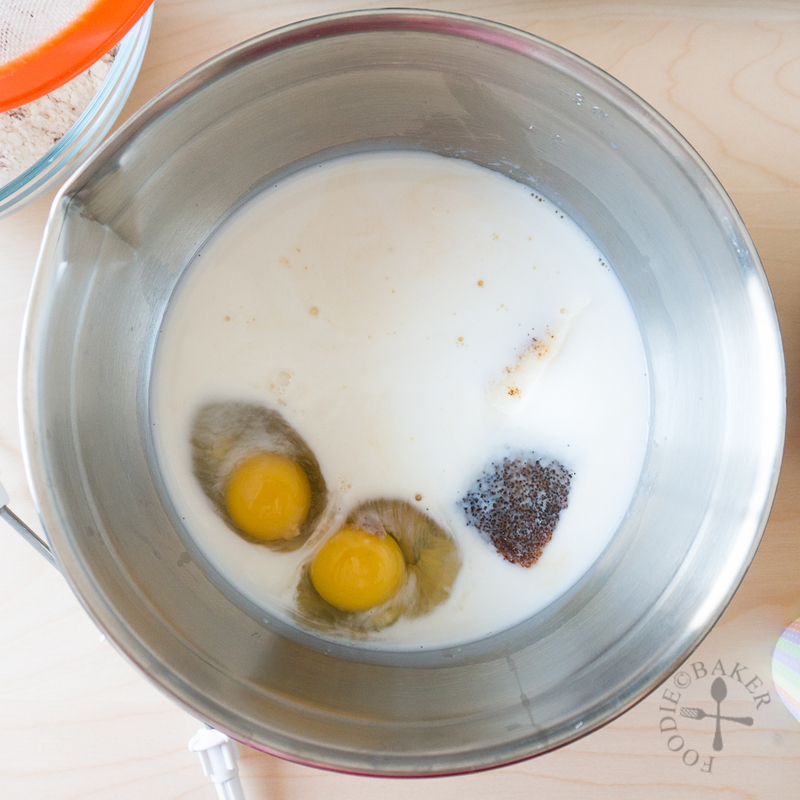 Measure the butter, caster sugar, brown sugar, vanilla, milk and eggs in a large mixing bowl. 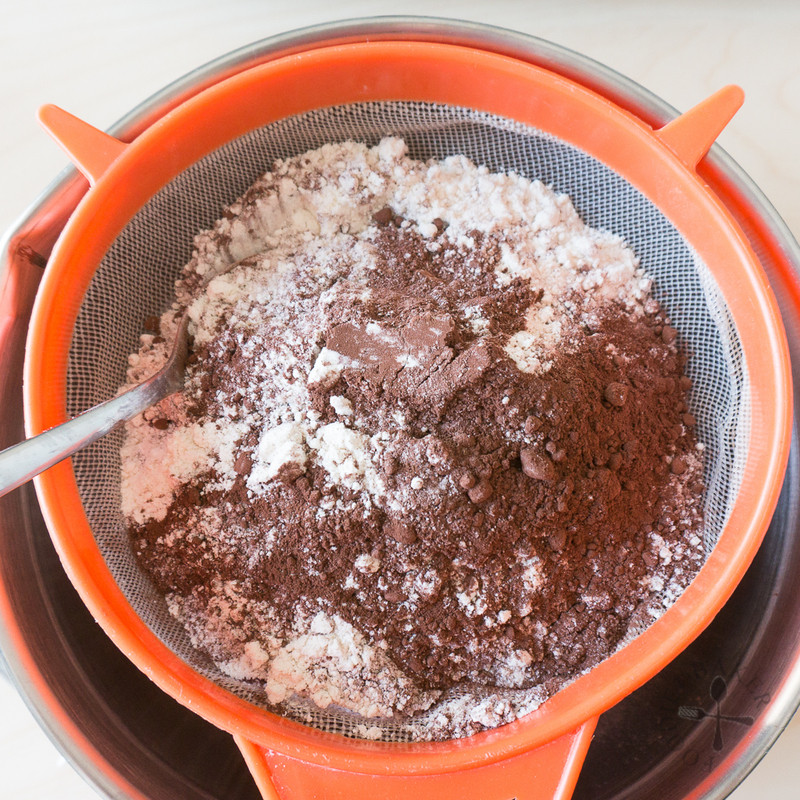 Sift in the flour, cocoa powder, baking soda, baking powder and salt. Using an electric mixer, mix the mixture on low for 1 minute, then on high speed for 3 minutes, scrapping down the sides occasionally. Fill the cupcake liners about ¾ full and bake for 22 to 25 minutes until cake is risen and a skewer inserted into the center comes out clean. Let cupcakes cool completely. Place the cream in a chilled mixing bowl. Whip the cream until soft peaks formed. 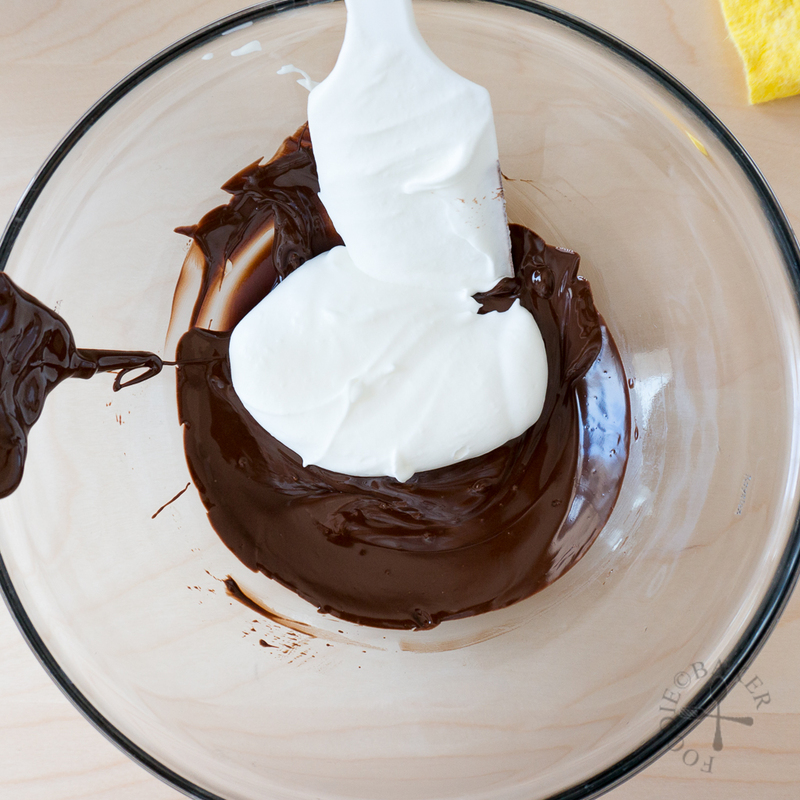 Fold the cream into the cooled, melted chocolate until fully incorporated. If not using immediately, chill the mousse in the refridgerator. 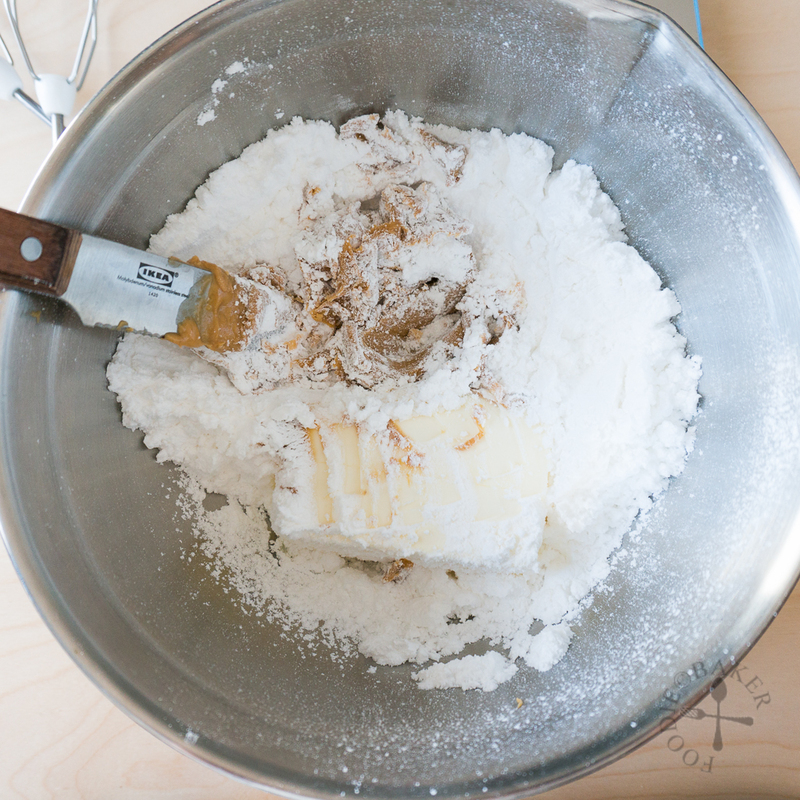 Place the butter, peanut butter, icing sugar and salt in a mixing bowl. Beat for 5 to 7 minutes until light and creamy. Taste and add more salt or icing sugar to get desired sweetness and stiffness. Using a small paring knife, cut a cone out of the cupcake. Fill with chocolate mousse to the top. 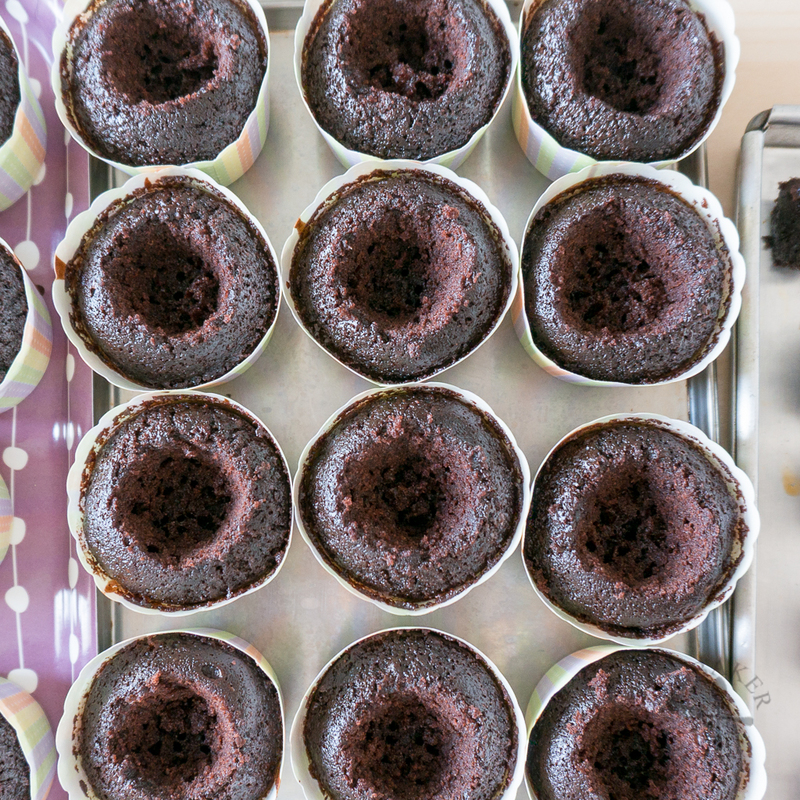 Cut off most of the small end of the cone and replace the top on top of the cupcake. 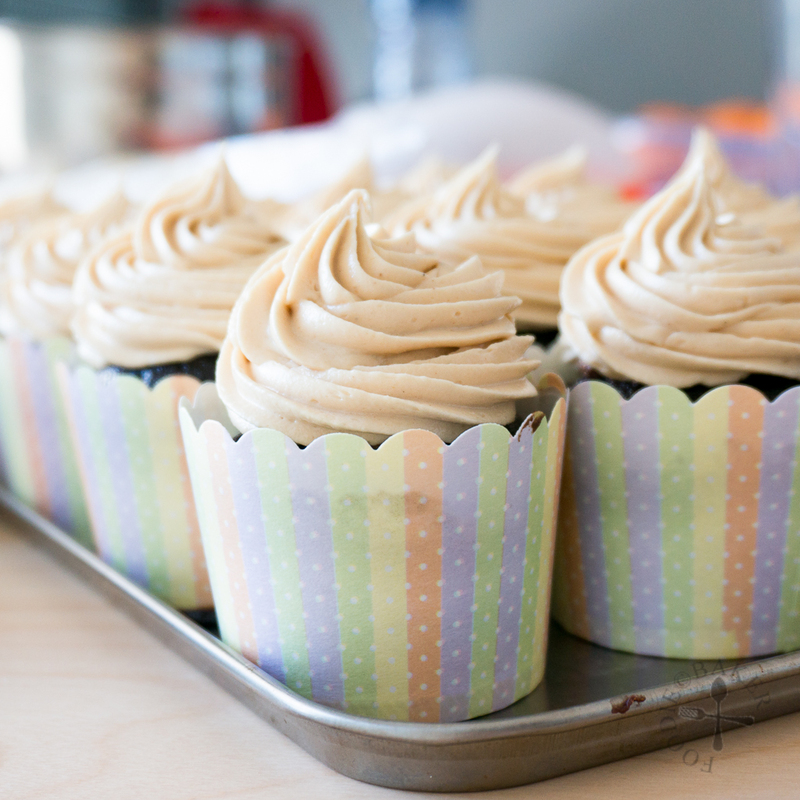 Place the peanut butter frosting in a piping bag fitted with a large star tip and frost the cupcakes. Decorate with chocolate balls if using. Store the cupcakes in an air tight container in the refrigerator for up to 3 days. 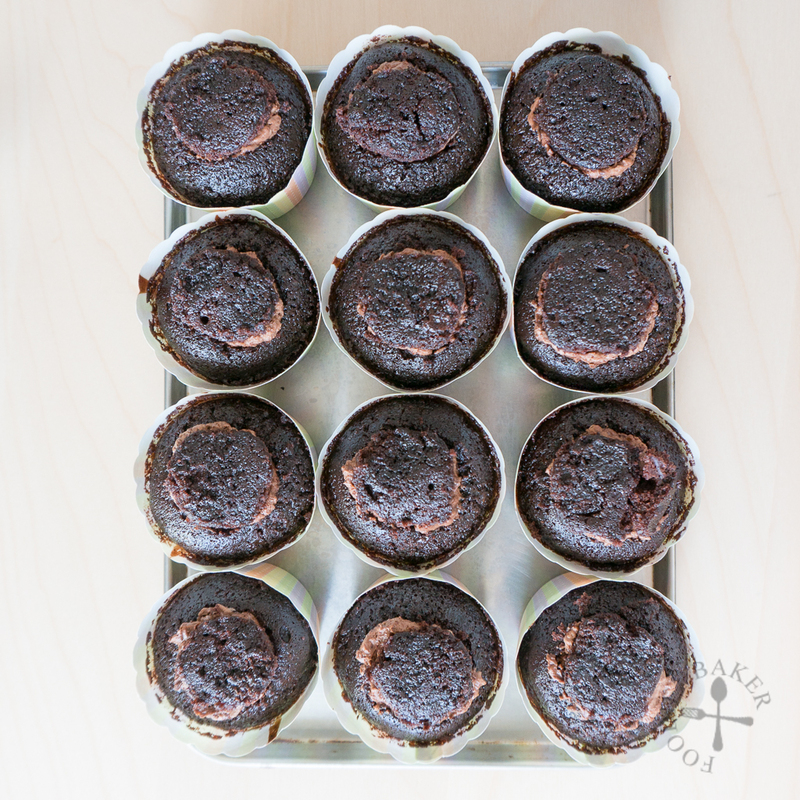 Let the cupcakes come to room temperature (let them sit on the table counter for about 15 to 20 minutes) before serving. - I've made the recipe with both dark and light brown sugar and found minimal differences. So use whichever brown sugar you have on hand. Thank you Charlie! Let me know how it goes for you! Thanks Cathleen, it’s so many people’s favourite combination! I love the combo of chocolate and peanut butter! One of the best combos. Ever! You’ve outdone yourself with these cupcakes — really good stuff. Thanks so much! 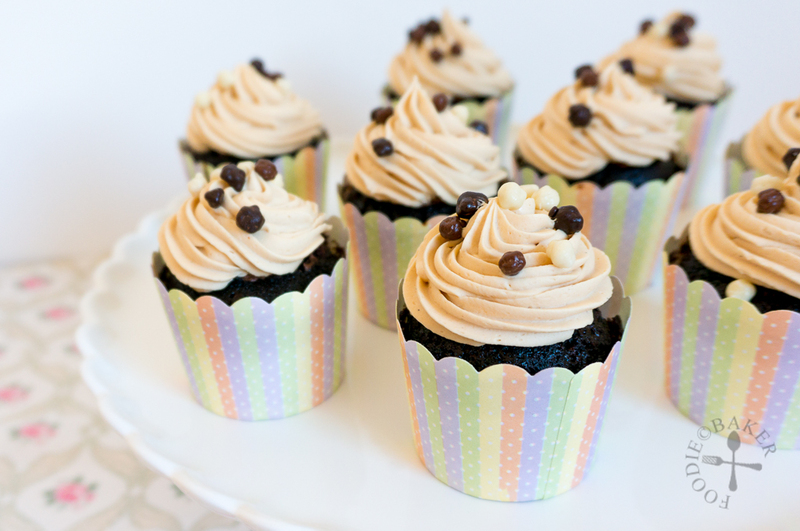 What magnificent cupcakes—and filling with chocolate mousse makes them SO irresistible!!! Thanks Liz! They are a very yummy combination indeed! 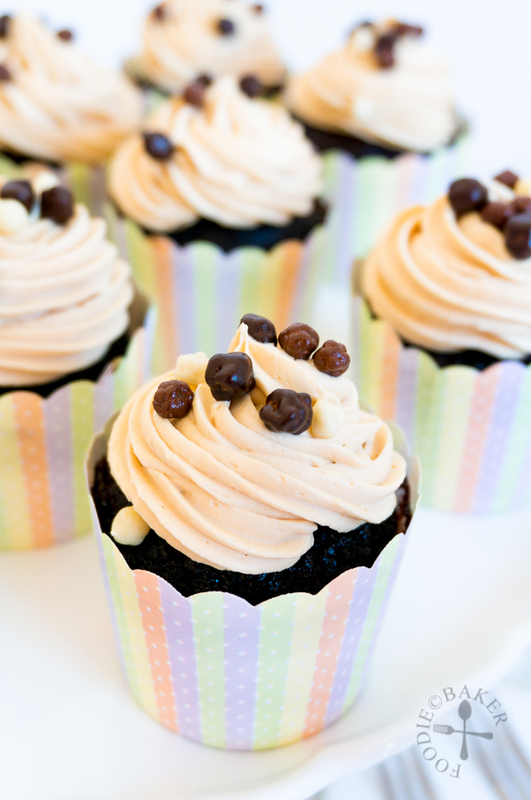 Definitely these chocolate + mousse + creamy peanut butter frosting cupcakes are yummy-licious. But I could only admire your lovely pictures … cos my waistline is beyond expansion. .. sob sob! Hi Karen! Awwww I know what you mean, but I’m sure just 1 won’t hurt, let’s exercise together! Cup cakes are so tempting. Wonderful clicks. 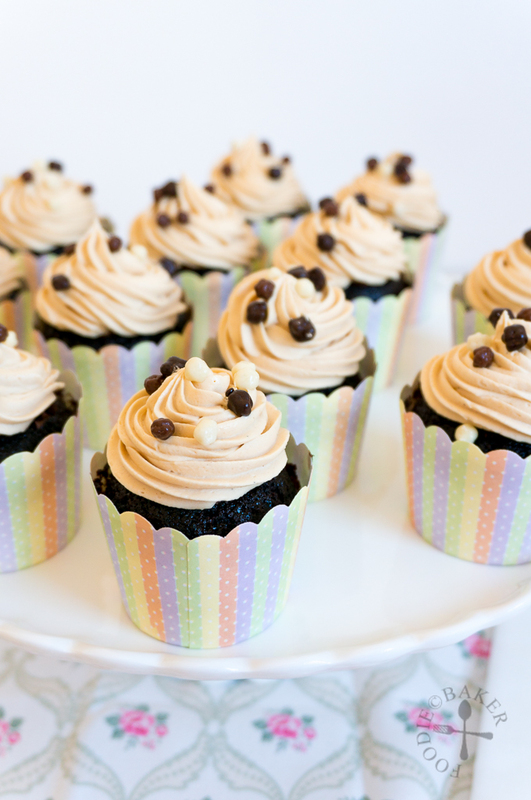 Wow Jasline, these cupcakes are so cute…and I love the combination of chocolate cake, mousse and peanut butter frosting. Thanks Juliana, it’s my favourite combination right now. Have a great week too! These look so good and I love the idea of that chocolate mousse filling. Hi Caroline, thank you! 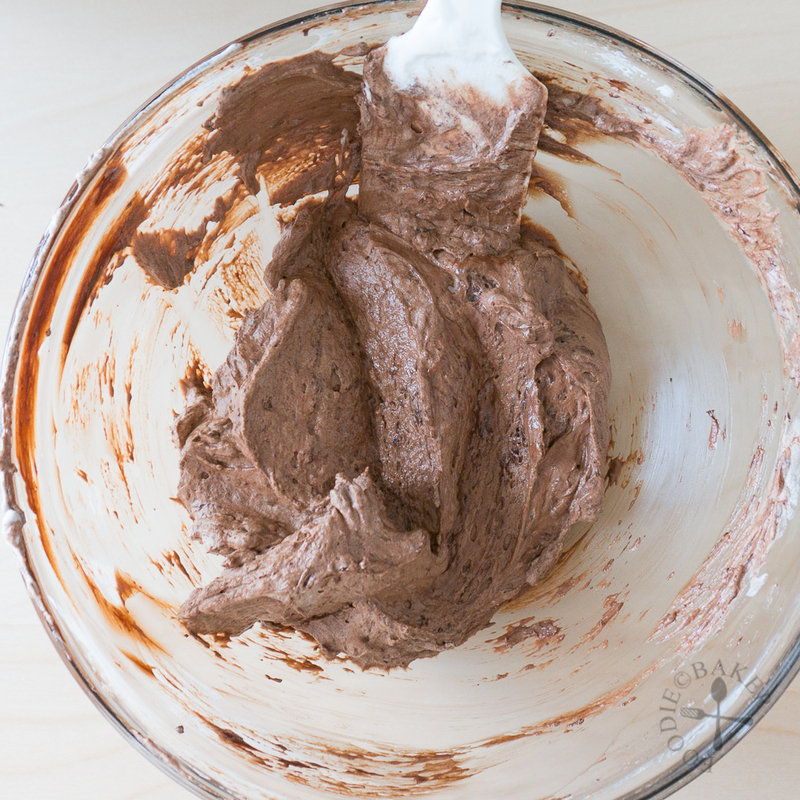 The mousse helps to keep the cupcakes moist! Your photos are great! Beyond great! Don’t ever say otherwise. And these cupcakes are probably my dream flavor. I would totally pay some serious cash for these at a local cupcakery! Looking at your lovely cupcakes makes me misses them. Hi Edith, thank you! Wish I can send one your way! These are absolutely a fantastic idea…choc…mousse…peanut butter…oh sounds so goood!!! Yes it’s a delicious combination that has never gone wrong for me before! Looks very attractive and feel like want some now! These lovely cupcakes are really great to serve crowd. Oh man, these look so perfect! Hi Georgina, thank you so much for the sweet comments! Looks super yummy! Gorgeous food photography, and this is making me so hungry late at night! Hi Jean! Haha reading food blogs at night is such a dangerous thing to do! I like your pictures, they’re so pretty and the paper cups too. But your bakes look very tempting too! 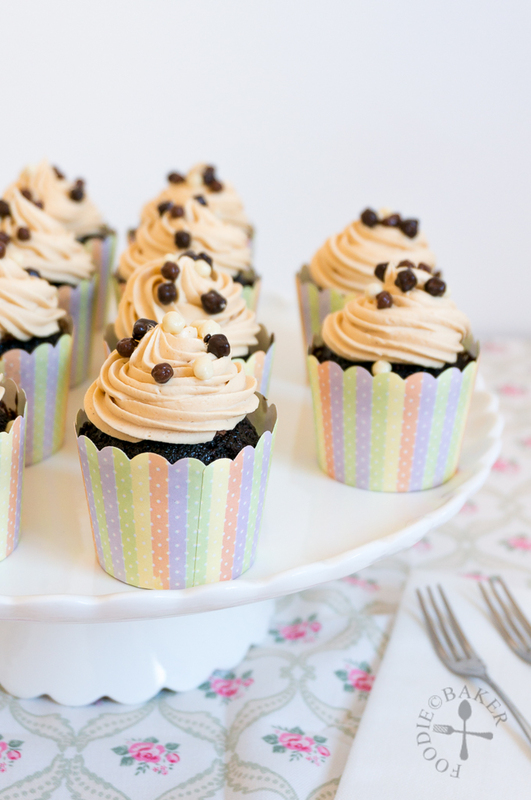 You know that I’m a chocoholic and these cupcakes look like heaven to me!